Cardio workouts on the stationary bike can help manage cholesterol. If high cholesterol has you down, don't fret -- lifestyle changes like spending more time on cardio can help. And that's a good thing, because high LDL cholesterol levels lead to plaque-like buildup in your arteries that can eventually create a total blockage -- causing a heart attack or stroke. While exercise is part of the solution, it's also wise to eat a low-fat diet to help protect your precious blood passageways. 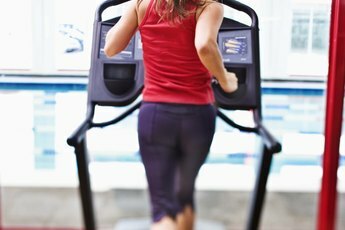 Done right, cardio can help cure your cholesterol woes. According to MayoClinic.com, starting an aerobic exercise program now can up your "good" HDL cholesterol levels by 5 percent in just two months if you're sedentary now. An activity qualifies as cardiovascular exercise if you use a major muscle group -- usually your legs -- and sustain your activity for at least 10 minutes. Get your cardio on with brisk walking, running, swimming or using the stepmill. If you're new to exercise or have health concerns, get your doctor's OK before starting a new routine. When it comes to cardio for cholesterol, think quantity over intensity. While you do need to break a sweat, exercising extra hard probably won't further improve cholesterol levels, according to the American Council on Exercise -- but exercising longer will. ACE recommends spending at least 30 minutes on moderate-intensity physical activities most days of the week, if not every day. Once you build endurance, aim for 60 minutes per day. Also include at least two days per week of strength training using weights, resistance bands or body-weight activities like squats and pushups. Hitting the right target heart rate ensures a moderate-intensity workout, helping you successfully win over cholesterol. First find your maximum heart rate by subtracting your age from the number 220 -- so at 29, your maximum heart rate is 191 beats per minute. For a moderate cardio workout, your desired heart rate is 50 to 70 percent of maximum, or 95.5 to 134 bpm at age 29. Once you reach 70 to 85 percent of maximum, you enter the vigorous cardio zone. So you know what your heart rate should be -- now it's time to find it. Pause your activity and place two fingers on the pulse point on your neck, next to your windpipe, or the pulse point on your wrist between the tendon and bone on the thumb side. Count the number of pulses for 15 seconds, then multiply that number times four to get your heart rate. For example, if you count 30 beats in 15 seconds, your heart rate is 120 bpm. Sharecare: What is Cardiovascular (Cardio) Exercise? What Does a Low LDL/HDL Ratio Mean? Do Side Bends & Twists Help Trim Down Your Waist? 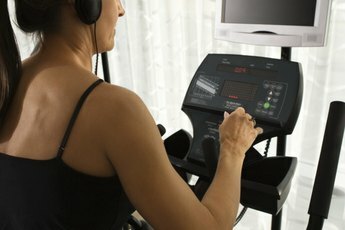 What Is the Difference Between Heart Rate & Pulse When Dealing With an Elliptical Machine? Does Cardio Exercise Make a Person Age?